I wanted to see Judas Priest on their farewell tour when it rolled through Winston-Salem a few years ago. But the mighty Priest wasn’t the only reason… There were three more. Scott Gorham, Brian Downey, and Thin Lizzy. I had never seen them. Sure, Phil Lynott has been dead for a couple of decades but this reconstituted band was the closest that I was ever going to get. And I got close being about 15 rows back from center stage. They were awesome. And they spoke onstage about recording an album and hitting the road again. They did the right thing and decided to drop the classic name of Thin Lizzy for Black Star Riders. Personally, I felt that they honored the work of Lizzy’s creative force Lynott with the live shows. But it just didn’t seem right to put out new material as Thin Lizzy. I don’t mean that as a snobby thing. Lynott was the creative force behind Thin Lizzy. Sure, Gorham lent his licks to Lynott’s songs but to claim the material as Thin Lizzy just didn’t seem right to me. I read some articles promoting the new album’s release and there it was… A name change was announced. That particular version of Thin Lizzy didn’t feel that it was right either. I jumped on ‘All Hell Breaks Loose’ when I had a subscription to Zune Pass. I devoured it the first day. I had the album in my random rotation. I was happy as a hermit crab in a new shell. I had some new stuff from Scott Gorham. Dare I say it, I was giddy. While this album sounds like Thin Lizzy and reeks of Irish sounds, it’s not Thin Lizzy. 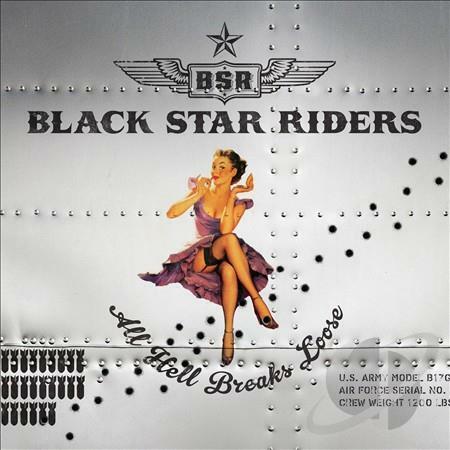 Black Star Riders were in effect. There’s enough of Black Star Riders that causes the initial Lizzy feel to fade some when listening. Yeah, there’s a wink in the lyric about “wearing dead man’s shoes” in the title track. Marco Mendoza’s solid bass playing along with Damon Wharwick’s vocals breathe new life into the classic sounds of Lynott’s ghost. ‘All Hell Breaks Loose’ is a darn good hard rock album. There are ear-catching hooks and the lyrics keeps the Lizzy tradition of storytelling that actually has meaning when you’re singing along. The production is solid. This is a good album for driving some winding mountain roads or sitting around with friends knocking back a few cold ones. Standout tracks for me are “Bound For Glory”, “Kissin’ The Ground”, “Hey Judas”, “Hoodoo Voodoo”, “Valley of the Stones”, and “Blues Ain’t So Bad”. And I also recommend the other two albums ‘The Killer Instinct’ and the latest ‘Heavy Fire’. Check out what Tim Beeman and Jon Lowder have to say about it on their blogs. I believe the singer is Ricky Warwick and Damon Johnson is the other guitarist. He co-founded Brother Cane.